On February 6, Dr. Hilton Muniz Leão Filho, president of Latin Safe, conducted the first meeting of the Radiation Protection Studies Group of the Paulista Radiological Society (SPR) in 2019. The meeting was attended by medical physicist Dr. Renato Dimenstein and was transmitted in real time over the Internet, with the participation of more than 10 professionals in the areas of radiology and physics. In May, Latin Safe will be present at the 49th São Paulo Radiological Meeting (JPR 2019), organized by the Radiological Society of São Paulo (SPR). Supporter of the Latin Safe initiative, SPR offered a booth for Latin Safe to be able to expose recent work and also to publicize its activities to more doctors seeking more community involvement in Latin America. Event in the area of radiology and physics, widely commented by Dr. Hilton, was the Brazilian Congress of Medical Physics (CBFM) conducted by the Brazilian Association of Medical Physics (ABFM). The event, which is in its 24th edition, is divided into two stages: the pre-congress courses, at the headquarters of InRad HCFMUSP (SP), and the congress itself at the Mendes Convention Center (Santos) – both have different inscriptions. Dr. Hilton will be present in both parts of the event. As pointed out by Dr. Thamiris Reina, from the University Hospital of the Federal University of Juiz de Fora, to register you must access the website and check all available information. As the vacancies are limited, it is necessary to anticipate as soon as the inscriptions are open. This year’s event is also celebrating 50 years of ABFM! Dr. Hilton cited the 24th International Conference on Medical Physics 2019, the Chilean Medical Physics event that will take place in September. He spoke of the importance of the event and how much he would like to be present and recommended to all those who have the opportunity to attend, as it is an excellent event. 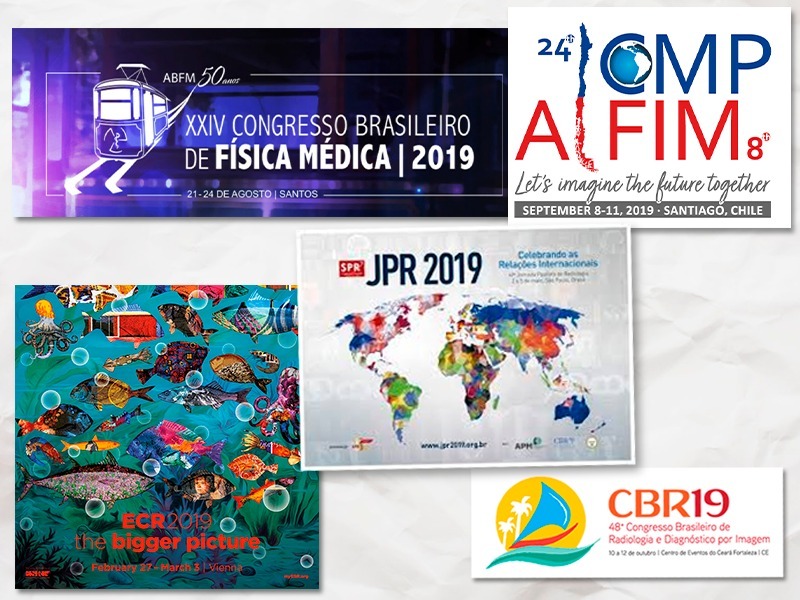 It was cited the Brazilian Congress of Radiology and Diagnostic Imaging 2019 (CBR19) in October, in Ceará. Dr. Hilton commented on the importance of increased participation of medical physicists at the event. Recalling the importance of the interaction between physicians and physicians, Dr. Hilton commented on how the two professionals complement each other and how the radiological process can achieve better results when both work together. He also quoted Dr. Cynthia H. McCollough, president of the American Association of Physics in Medicine (AAPM). Dr. Thamiris complemented her speech by explaining how she achieved this interaction in the hospital where she works and stressed that radiologists need to understand the role of the physicist in the hospital so that they reach a consensus of language improving the implementation of the hospital protocol. A retrospective and prospective study with educational intervention in the emergency sector of a private hospital; 140 thousand users; 8,500 monthly clinical visits; 6,500 pediatric patients. Protocols proposed by the Choosing Wisely international campaign will be used, which advocates the dialogue between doctors and patients, guiding the choice of the most adequate, evidence-based, double-checking procedure or procedure, without harm to the patient and really necessary. The Choosing Wisely initiative has grown around the world since its launch in 2012. The international campaign aims to combat the overuse of medical resources and has several recommendations. Also addressed were apps that could help the medical team in the matter of dose reduction in exams performed and the creation of a CBR Radioprotection commission in partnership with Latin Safe, coordinated by Dr. Alair. Finally, Dr. Dimenstein has appealed to all who accompany Latin Safe to gather more content and materials that can help radiologists and physicians understand more and more about radiation control and inform patients. Everyone who can contribute is invited to do so; Latin Safe is an open and collaborative platform. Reviews of relevant literature, small videos (even if homemade), articles, etc. can be sent. – always by email latinsafe@latinsafe.org. The next meeting will be held on March 20; soon, we will post the link to follow the meeting virtually.